Oh what luck to receive a sweet gift from Edible Gifts Plus this St Patricks Day. You never need a reason to send something sweet to someone even sweeter, so why not let this festive and green celebration be reason enough to send one of our edible gifts? We have many ways to spread some green cheer in the form of something sweet. From hand designed Oreo cookies covered in edible four-leaf clovers to our Irish inspired gift baskets and mugs, it’s easy to find the perfect gift to send this St Patrick’s Day. Do you know someone who likes lollipops? Ok, let me rephrase that: Do you know anyone who DOESN’T like lollipops? Everyone loves a sweet lollipop, children and adults alike. There is just something so fun about these popular treats. Some of our favorite St Patrick’s Day gifts are our lollipop mugs. We have quite a few to choose from like the Kiss Me I’m Irish Lollipop Mug. The coffee mug, which reads “Kiss me I’m Irish,” is filled to the rim with a variety of 12 festive lollipops. All the lollipops are made daily and include green apple, wild cherry and our number one requested flavor – marshmallow. Just like lollipops, we never outgrow our love or Oreos, that’s why our St Patrick’s Day Oreos Gift Box is perfect for anyone of any age! The cookies are dunked in your choice of decadently delicious fine gourmet Belgian Chocolates – dark, milk or white – and decorated with hand-crafted Royal Icing Leprechauns and Shamrocks and assorted Saint Patrick’s Day Candy Sprinkles. And of course, who can resist the cream filling!!!!??? If you really want to send someone some good fortune for St Patricks Day, you have to check out our giant gourmet fortune cookies! Still need more green gift ideas? No problem! Visit the St Patrick’s Day gift section of our website to see our complete selection. February 15, 2012. 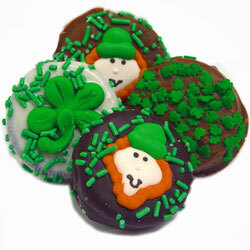 Tags: st patricks day cookies, st patricks day gifts. St Patrick's Day Gifts. Leave a comment. While St. Patrick’s Day isn’t traditionally thought of as a gift giving day, here at Edible Gifts Plus, we’ve painted some of our most delightful cookie gifts green, to help spread a little luck o’ the Irish this St. Paddy’s Day. If by chance you don’t happen to have a pot of gold lying around the house, why not spread some cheer with our adorable St. Patrick’s Day Cookie Bouquet? A beautiful assortment of 7 Shamrock shaped sugar cookies are hand decorated by our talented confectionary designers. You can add your personal touch by including a special message on the center cookie. 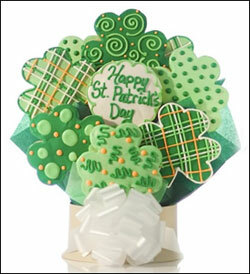 Our St. Patrick’s Day Cookie Bouquet is a wonderful way to spread warm Irish wishes! Anyone in need of a little luck will definitely appreciate receiving some good fortune…and we do mean good! Our giant St. Patrick’s Day fortune cookie weighs in at just under 1 pound and is almost the size of a football! To satisfy your sweet tooth, we first hand dipped it in your choice of the finest gourmet Belgian Chocolates (dark, milk, or white), delicious gourmet confections (strawberry or peanut butter), or rich, golden gourmet caramel. The, we decorate it for St. Patrick's Day with 100% Hand Made Royal Icing Decorations. Finish it off with your own personalized message on the foot long fortune inside the cookie! This beautiful cookie is sure to bring someone some luck and good fortune…it's a perfect gift and greeting all-in-one! February 18, 2010. Tags: giant fortune cookie, irish mug o' beer, st patrick’s day cookies, st patrick’s day gifts, st patricks day cookies, st patricks day gifts, st. patrick's day oreos, the cookie bouquet. Uncategorized. Leave a comment.